As Shalom explained in his answer to a question about chalav Yisrael milk, R' Moshe Feinstein ruled that in countries where the local government regulations are sufficient to ensure that cow's milk is not tainted with the milk of non-kosher animals, any milk can be considered chalav Yisrael even if there was no Jew supervising the milking of the animals. Not everybody accepts this leniency and those who do not are careful to only consume dairy products whose production was directly supervised by a Jew. Logically, those who do not accept the leniency would consider the dairy to be completely non-kosher (as Shalom said, "Today we speak of 'chalav ha-companies', or 'chalav stam', which means: 'milk whose status is viewed as chalav yisrael by some, and chalav akum by others'"). Yet I know that there are people who do not accept R' Moshe's leniency about chalav stam being kosher, though they are not careful to avoid dairy products served, prepared, or cooked on equipment that has been used for chalav stam. What is the justification for eating chalav stam-equipment foods if chalav stam is considered not kosher? (I asked this question to someone I know who does this and he said he doesn't know how it's justified. He does it because he otherwise wouldn't be able to eat at his in-laws' house so his rav gave him permission). Rav Yaakov Kamentesky actually addresses this question in his Emes L'Yaakov on Shulchan Aruch, 115 (p. 308). He writes that the keilim are fine since it is comparable to the case that the Rama brings in YD 64:9, about a certain fat which contained questionable kashrus. The Rama allowed those who were stringent regarding the fat to eat from the utensils of those who were lenient about the fat in question. 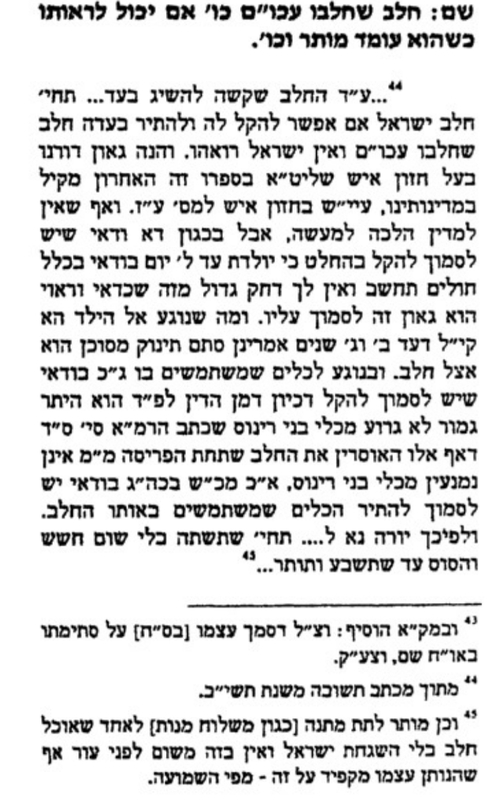 If you look on the bottom in the footnotes, you will see that Rav Yaakov also held that one who is stringent can give shaloch manos of non chalav yisrael to someone who is lenient. It should also be noted that Rav Yaakov himself was only lenient is very special need cases. Most people who are careful not to rely on Rav Moshe's leniency do so not because they don't hold of it but only because he advised that people of superior spiritual stature avoid relying on it. I conjecture as follows. Other, standard leniencies (e.g., lifgam) very often apply to cases of using equipment, so even such people combine those leniencies with Rav Moshe's in the vast majority of cases (even if they wouldn't rely on the other leniencies alone). And this led them to simply not worry about the minority of cases where Rav Moshe's is the only leniency applicable. When it comes to those who simply do not hold of Rav Moshe's leniency at all, obviously the preceding doesn't apply. However, in my experience with such people, they don't, in fact, rely on Rav Moshe's leniency for equipment, either. I have had guests for whom I've kashered equipment for this reason. Not the answer you're looking for? Browse other questions tagged halacha kashrut-kosher chalav-yisrael-jewishmilk .